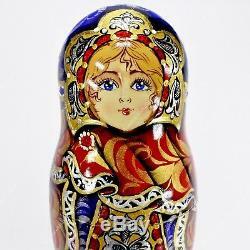 This is absolutely gorgeous author's Russian nesting dolls, fantastic quality fine and detailed hand painting. 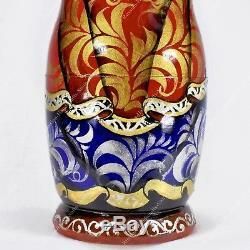 Richly decorated with gold, varnished. It's worth to pay a special attention to it's stunning volume and shadow effects with lots of glittering. 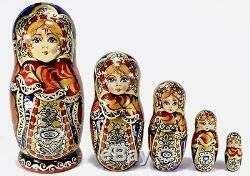 Biggest doll size 15 cm / almost 6 inch, the smallest 2.5 cm / 1 inch. S-Petersburg, Russia, signed by artist. The top quality and authenticity of this product from woodwork to finishing touch is guaranteed. Please note - all the terms can not be guaranteed as they COMPLETELY depend on a postal service, delays are not common but still happen. A signature is required upon receiving a parcel. 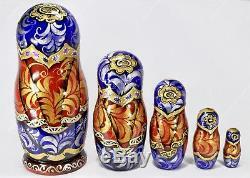 Please note: The item you actually receive may slightly differ from that one on the photo due to hand painting and difference in decoration of each doll. CHOKING HAZARD - Small Parts. Not for children under 3 years. 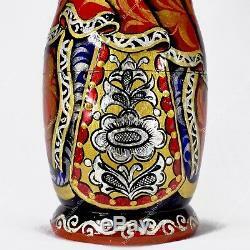 The item "6 AUTHOR'S GORGEOUS AUTHENTIC RUSSIAN TRADITIONAL MATRYOSHKA NESTING DOLLS 7PCS" is in sale since Friday, October 12, 2018.